First off, there is no grading on a curve here and no gold stars for trying. Just because director Michael Bay has made his first film to not star “explosions” as the lead actor doesn’t mean he gets a free pass. Pain and Gain has actual character arcs and sports an interesting point of view while attempting something modestly original. That’s what movies are supposed to do. The question is, did Bay do it well? If you didn’t know that Christopher Markus and Stephen McFeely’s script was based on a true story before heading into the theater, don’t worry. They will tell you many times, and not just before the film or after, but several times during. This is the real(ish) story of Daniel Lugo (Mark Wahlberg) a musclebound moron who wants the American dream without having to put in work in the American reality. So he gets fellow meathead Adrian (Anthony Mackie) and felon-turned Jesus freak Paul (Dwayne “The Rock” Johnson) to help him kidnap Victor Kershaw (Tony Shalhoub) and torture him until he signs over all his considerable worldly possessions. After being left for dead, Victor’s claims are mocked by the police. Enter Ed DuBois (Ed Harris), the only creature with a conscience in the whole film. He sets out to prove the triad of lunkheads is guilty before they do something even worse. Rebel Wilson, Ken Jeong and Rob Corddry show up in wink-and-nod cameos, with Wilson once more proving her worth as a sporadically used improvised genius. Don’t worry, Bay can’t resist entirely, as the whole thing culminates in an epic chase. Other things Bay can’t resist: fake breasts, strip clubs, making homophobic jokes, using tracking shots of Miami and confusing frantic camerawork for effective pacing. 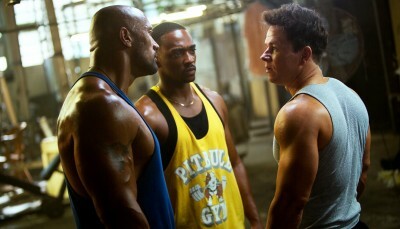 The problem with Pain and Gain is that it is simultaneously really great and really terrible. Johnson gives a career performance with a role that could have been garish and clowny. Instead, he dials back on the extremes and gives a comical drug abuser reluctantly falling off the wagon as he overenthusiastically clings to the messiah. Wahlberg is in full “What you think you better than me?” mode, which is easily among the most grating signature performances from an actor. See? Yin (Wahlberg) and Yang (Johnson). So too does the tone simultaneously infuriate and entertain. Although Bay and company never invite us to wholly root for these morons, it’s at least encouraged by their earnest voiceovers. But how to reconcile that with the truly despicable acts they eventually perform. And right as we’re encouraged to laugh at a dark moment, the screen displays a reminder that this actually happened. It’s like telling a hilarious dirty joke and then chastising whoever laughed. Then there’s the problem of the film’s message, which is far too self-aware to believe coming from Bay. If this is truly an indictment of American excess, do we really buy it from the guy directing Transformers 4? Pain and Gain gets points for originality, loses some for being bloated, gets extra credit for The Rock and is penalized for confusing tone. Buck up, Mikey; a C average is way better than what you’re used to.